Chris Chester wants to see Wakefield Trinity end their 2018 season on a high when they host Warrington Wolves at the Mobile Rocket Stadium this evening (7.45pm). 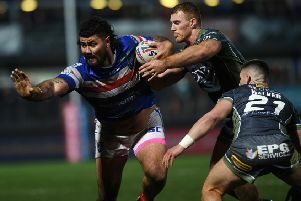 Trinity have won three and lost three of their Super 8s fixtures thus far while Warrington have been beaten in their last two outings against fellow semi-finalists Wigan Warriors and St Helens. Ahead of the Super 8s split, Chester says his side aimed to win more games than they lost, and he feels that tonight’s fixture gives his players the perfect opportunity to claim their fourth win since the end of the regular season. “To go out on a high would be very pleasing for us as coaches and I am sure for the fans as well,” said Chester. “It is the least we deserve, when we got the split we sat and discussed that we wanted to win more games than we lost in the Super 8s. “We have got a great chance of doing that in front of our great supporters. The season has been very challenging and we have put a lot of expectation on ourselves, after where we finished last year. The Trinity boss believes that a second-consecutive fifth-placed finish would provide a real boost for Wakefield on the recruitment front. The current prize money for finishing in fifth is £75,000, compared to the £50,000 received for completing the season in sixth. And Chester now feels that there is a belief that Wakefield can consistently challenge toward the top end of the table. “There is a belief within the coaches and there is a belief within the group,” replied Chester when asked about Wakefield’s top-four credentials for 2019. “I believe there is a belief within the opposition as well. "When you speak to opposition coaches they say we are a very tough team to beat. And you probably couldn’t say that about Wakefield Trinity three or four years ago. “To finish fifth two years on the bounce would be a great achievement. Wakefield will go all out for fifth, says Huby. “We are competing against teams that have got a lot more resources and that spend a lot more money as well. There is a great belief here and there is a great team spirit here. “The money (for finishing fifth) makes a big difference, it means we can spend a little more on the salary cap as well. Trinity are “very close” to making their first signings for the 2019 season. The club have tied down the majority of their squad from this campaign and Chester is hopeful there will be new recruits within the coming weeks. “At the minute, we haven’t got any pen to paper on certain players but we are very close to getting a few over the line,” added Chester. One player that won’t feature for Wakefield until next season is Danny Kirmond. The Trinity captain failed a fitness test and despite his best efforts, will have to wait until next year before he makes a return to competitive action. Scott Grix will also miss the final game of the season after fracturing his cheekbone. Meanwhile Anthony England is set to undergo surgery for an elbow injury. Jacob Miller has returned to the squad after missing the defeat at Castleford Tigers through illness last week.